Mole Valley Valves - Edinburgh Fringe Reviews: "Life is a series of small disasters we try to get through"
"Life is a series of small disasters we try to get through"
Thus spake Michael Palin, whose "Diaries 1969 - 1979" have been taking up most of my reading time since last I posted. Like many diarists or autobiographers, Palin is quite hard on himself, especially about taking the advertiser's shilling in the early '70s. 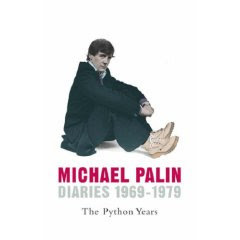 Much fun to be had for Python fans in this volume as Michael is often quite revealing about his fellow Pythons, with Cleese (selfish), Idle (obtuse and rather greedy) and Chapman (drunk) particularly coming in for criticism. His "nicest man in showbiz" reputation is assured by his agonising over how changes to their working relationship post-Python effects Terry Jones. This has led me to embark on a highly enjoyable voyage round "Ripping Yarns", which I recently got on DVD. The commentaries (featuring Palin and Jones) are excellent, even if they do spend a lot of time laughing at their own jokes, a trait I share, and Palin continues the obsession with his teeth that comes across strongly even in the (heavily abridged) diaries. The most surprising aspects of the diaries for me were Palin's staunch socialist beliefs which are unwaveringly given in the early '70s. Frustratingly his reaction to Mrs Thatcher's election in 1979 has not been included, so whether or not he had mellowed with the introduction of money and comfort to his life is not clear. More pressingly he wrote a novel in 1977 that he then seemed to discard. As a great fan of his only published novel, "Hemingway's Chair", I was simulataneously elated and disappointed that it's unlikely this work will ever see the light of day, shame.